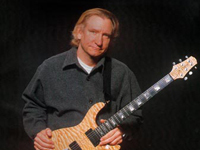 From his early hits with the James Gang through to his tenure with the Eagles — as well as a successful solo career — Joe Walsh remained one of the most colorful characters in rock & roll, lending his distinctively reedy vocals, off-the-wall lyrics, and expansive guitar leads to a series of AOR staples including “Funk #49,” “Rocky Mountain Way,” and “Life’s Been Good.” Born November 20, 1947 in Wichita, KS, Walsh initially studied the oboe and clarinet, later playing bass in local bands the G-Clefs and the Nomads; while attending Kent State University, he finally picked up the guitar, fronting the collegiate combo the Measles from 1965 to 1969. 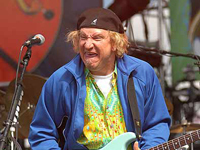 He then joined the Cleveland-based hard rock trio the James Gang, appearing on their debut LP Yer’ Album. The trio’s 1970 album, The James Gang Rides Again, proved the group’s commercial breakthrough, launching the FM radio favorite “Funk #49″ and achieving gold status. While the follow-up, Thirds, was another success, yielding the classic “Walk Away,” Walsh found the James Gang’s power-trio format too confining and left the group soon after. After relocating to Colorado, Walsh formed a new group, Barnstorm, recorded a self-titled 1972 LP before making his proper solo debut the following year with The Smoker You Drink, the Player You Get. The record cracked the Top Ten on the strength of the pop hit “Rocky Mountain Way” and was followed in 1974 by So What. In the wake of 1976′s You Can’t Argue with a Sick Mind, Walsh replaced guitarist Bernie Leadon in the hugely popular West Coast rock quintet the Eagles, making his debut on their best-selling Hotel California album. He also continued his solo career, issuing But Seriously, Folks in 1978; the record’s highlight, the hilarious “Life’s Been Good” — a dead-on portrait of rock star debauchery — became his biggest pop hit, nearly reaching the Top Ten. In 1979, Walsh announced his campaign for President of the United States, promising “free gas for everyone” if he won (he didn’t.) The Eagles’ final studio album, the chart-topping The Long Run, appeared that same year.